On 29 March 2018, artist Ada Xiaoyu Hao presented a new lecture-performance, The Mask of Sanity at the Stuart Hall Library. This was the first Research Network event of the new programme, ‘Duties of Self Care’. This event brought together themes of bodily trauma, othering, technologies and Ada’s experience as a diasporic student. This was followed by a response from independent curator and writer Annie Jael Kwan, whose current research centres around Southeast Asian women artists, performance and archives. You can read Annie’s response below. Thank you for sharing your fascinating and yet elusive performance and practice. I was very pleased and challenged to have been asked to be the respondent to your research and performative lecture, and I thank the Stuart Hall Library and Iniva for the opportunity to get to know your work. Since you shared with me your images, video and texts, I’ve been thinking about the work, not just in terms of what it is you do – though that is indeed rich for discussion and exploration, but also what the work asks of me. You have framed the work in terms of “Duties of Care”, so that raises the question – how should I, as a viewer, care about the work? What kind of care does it desire or need? And in the role that I’ve been placed – as a respondent, how should I speak with care about it? In your work, you centralise your body – a female Asian/other body situated here in the British/London/Western context. I too understand that experience of “Other”. At times, in the images where the camera has zoomed in, the body appears androgynous. The body you make us aware of here is via its skin, its membrane – that acts as a surface, a screen – offering protection as well as a tactile texture to encounter. The skin here encloses the body, and also presents the body. It veils the body’s insides, the things that render a body unnatural when fallen outside – and also becomes what we know of the body via our immediate senses of sight, smell and touch. The body-skin is a space of possible encounters, intimacies and sensualities. As you give attention as a form of care to your body, it created a visceral empathetic response in me. I became aware of my skin and my body too. The mode of attention zoned down to a micro level – your skin, my skin, our skins – that are made out of millions of epithelial cells that are tightly packed next to each other. These cells line not only our skin, but also the outer surfaces of our organs, blood vessels and the inner surfaces of cavities in internal organs. They stretch and produce the sweat that cools us down, and also help us experience our environment by having special sensors. These chains of cells from the outside to the inside of the body carry information. As the safety shields of the body – the barrier between the inside and outside of your body, epithelial cells protect your body by being a barrier between your internal cells and the dirt and microbes in the environment. They are often the first place that is attacked by viruses before they begin their invasion deeper into the body. As we move through this space in the Stuart Hall Library, this Shoreditch neighbourhood, this city of London, this planet earth – we are constantly shedding epithelial cells. We lose millions of dead skin cells; we leave a trail of shed skin everywhere we go. Like a trail of crumbs in this labyrinth we call humanity. Skin cells and hair fall everywhere and leave a kind of human dust and detritus. Approximately 30,000 or so scales of skin flake off our bodies every minute! This library space holds not only a repository of knowledge produced but also holds all our shed cells tonight. Approximately 108 million of them. [很多很多 很多 很多 很多 很多!] These cells, these organic archives – hold DNA information. They hold knowledge of our genetic information. Genetic codes that may be able to tell us our areas of ancestry but cannot provide a marker that differentiates between nor defines “race”. These trails of cells co-exist, washed around planetary streams, strewn and kicked around pathways, though yet, at border crossings and places where self-identification is necessary, it is the legal document and its limited information that defines us. You described the experience of performing a forced encapsulation of identity at the border or in institutions as uncomfortable. But you also mentioned how by pouring latex on your skin in your performance – where the liquid latex itself imitates skin, stretching and forming a protective coating that you rip off after the performance – the process of care and careful attention is a discomfiting, at times a painful, process. 很痛苦! It takes the epithelial cells and hair from your body, and the rubber skin, are shed together at once as a relic. This peeled-off object with your extracted organic material and imprint makes explicit the larger notion of the archive of human dust. And it raises some questions – what is this object? Apa ini, lah? How do we care for it? Does it belong to a pathological display? In some contexts, is it forensic material? Or can we see it as the relic, not just of a performance but of an artist? How do we care for the relic of an artist without trying to commodify it? And returning to your experience of sialometaplasia, which is the lesion that was formed and the tissue regeneration caused by trauma in the upper palate of your mouth – you expressed how it was a moment of recognition of the body being separate to your sense of self, where the body can somehow exceed the self, misbehave, and be uncontrolled by the self. 一种走火入魔? And the body may respond to medical care, or it may not. Sometimes it is not known if it will or will not. The body has its own rules and operations that not even medical science can manipulate or control fully. To address this ruptured awareness that has happened with you between your body and your subjective self, you seek out modes of transformation to perhaps transcend or transition beyond it. These bodily transgressions find modes of expression in popular culture. The cyborg you’ve cited from Donna Haraway’s Cyborg Manifesto, written in 1984, speaks of the cyborg that rejects rigid boundaries, especially those separating human from animal, human and machine. This manifesto urges a feminist strategy that seeks affinity and coalition – beyond limitations of traditional gender, as discussed by Judith Butler, that are constructed via verbal, bodily, nonverbal and societal codes. This strategy also attempts to surpass other systems of language and politics that seek to define subjectivity by narrow, pre-determined categories. It is the boundaries that are tested with a sensitive awareness of its limitations, even if sometimes stretched beyond recognition. When I think about your practice of separating this latex skin from your body to form a relic, I have two questions. The first is about the value of the copy in some contexts. In European aesthetics, we tend to value the ‘aura’ of the artwork and have scepticism towards mass production and consumerism. However, recently, Byung-Chul Han, professor of philosophy and cultural studies at the Berlin University of the Arts, wrote an article to suggest that in other cultural contexts the copy is just as valuable as the ‘original’ – both are seen as the same. The copies are seen to carry the ‘real trace’ and do not convey an essential notion of being but are seen as ‘persisting creation’. Han suggests that this perception is only conceivable in a culture that is committed to revolutionary ruptures and rifts, and to process and change. I also think about the disquiet your work might create in fields we associate with precision. An analogy that is told to explain fuzzy mathematical categories – if you describe a cat – it is a creature with four legs. If you remove a leg, it is still a cat. If you remove another leg, it is still a cat. At what stage, does it cease to have its cat-ness? Even the floating head of the Cheshire cat is still ‘cat’! In the reverse, I think about the relics that you shed and produce – are they still you? If you have the capacity to generate relics, are your relics are in your lineage? [这东西, 这是你吗？] If you, Ada who is still completely Ada – plus one relic-to-be, is that you still Ada, even if the relic has not left your body? At what stage, does it stop being Ada, and constitute a completely separate relic, even if it contains genetic material that possibly could identify or clone you? These musings unfix our typical categorisations of what we think is a “self”, or a “you” that has different personifications as well. 如果我混入,是你和我吗？如果他们不了解我们, 他们也可以混入,相处吗? Bagaimanakah google ini menerjemahkan bahasa Cina? Your search for non-human forms led me similarly to seek out creatures that could be sympathetic to the cause – the mollusc whose shell is usually a calcareous exoskeleton that encloses, supports and protects its vulnerable parts. Molluscs include snails, clams and so on – some live on land, some in the sea and some in freshwater. Some molluscs have the ability to form nacre, which is commonly known as mother-of-pearl. This nacre forms the inner layer of the shell structure and is created by epithelial cells of the mantle tissue. This nacre has a protein which helps elasticity and makes the nacre resistant to cracking. Mollusc shells (especially those formed by marine species) are very long lasting and can persist beyond the otherwise soft-bodied animals that produce them by a very long time. These leftover large amounts of shell can form sediment, and over a long geological period can become compressed into limestone deposits. 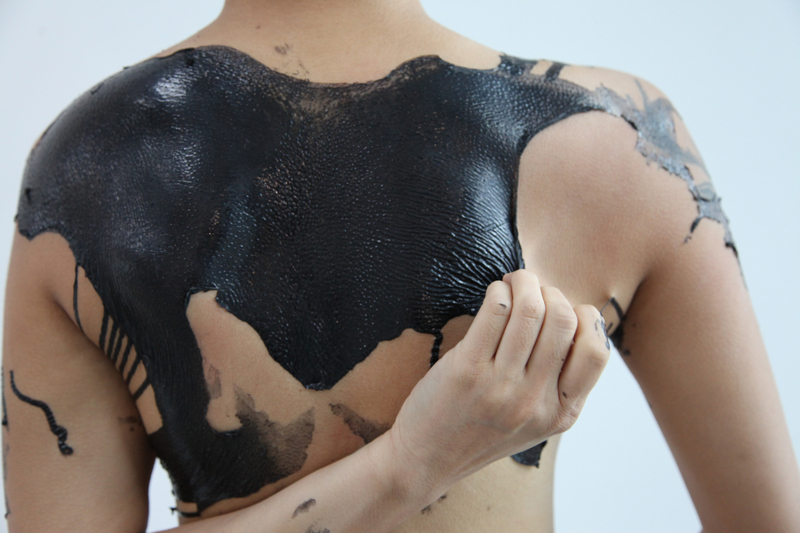 In this I find a useful metaphor for the processes you’ve undergone and are exploring – where your skin is used as a protective layer and can harden and be shed to leave fossilised material, and in turn becomes embedded back into the earth material. I find the non-human metaphor here useful for a broader non-humanistic thinking about an organic collective sense of being in an expansive world. We’re all in it together! And finally, you reiterated that you define “Duties of Care” as a form of collective attention. In your presentation, you offered no prescribed order to the selection of images you showed but asked the audience to participate by selecting them. It made me question what is this communal attention, what is the quality of this care? In colonial archaeology and taxonomy, attention results in an extraction of information. How do I classify you? How do I break down ‘you’ down into measurable forms I can record and control? We have seen this practice in the most extreme historical cases – in slavery, where people are weighed, described by age, gender, birth marks, and scars. Or in the prisons of Tuol Sleng when the Khmer Rouge measured, weighed and photographed prisoners like specimens before executing them. Hence I wonder if collective attention can also be violent, and when must we agree to turn away our gaze? Thus, as we’re seeking to unpack and ‘sort’ your performance work, I am reminded of Edouard Glissant’s argument for the right to opacity. Agree not merely to the right to difference but, carrying this further, agree also to the right to opacity that is not enclosure within an impenetrable autarchy but subsistence within an irreducible singularity. Opacities can coexist and converge, weaving fabrics. To understand these truly one must focus on the texture of the weave and not on the nature of its components. For the time being, perhaps, give up this old obsession with discovering what lies at the bottom of natures. So even as I’ve been reaching for different references and concepts to try to understand your process and your art, I am aware, Ada 很好的小鱼 非常好的小鱼 that these are my projections. These theoretical fancies may dance around our encounter, but I do not, and cannot, know it completely. And this is also being caring and careful. As a fellow migrant, I share you sense of slippage between languages, cultural codes and mistranslations. Growing in a multi-lingual, multi-cultural country, I am used to the rapid flexibility of borrowing phrases between languages (English, Mandarin, Cantonese, Hokkien, Teochew, Malay and Tamil) and speakers are adjusted and accepting of mis-spoken or mis-pronounced words. Also, in response to your desire for a collective attention as ‘care’, I also asked the members of the audience to read different segments of the letter. Do you think they would know this wuxia term? Kristeva, Julia “Approaching Abjection,” Powers of Horror, Columbia University Press 1982, p2-3  You expressed to me, Ada, that you often experience mistranslations and misapprehensions as you move in and out of different languages. Here in London, the migrant is often judged as to how perfectly intelligible we are. They also say that bilingual or trilingual migrants are far more comfortable with not understanding every single word. Do you think they’ll accept this language play in my text? Would they assume the Chinese is correct? Perhaps, Google Translator will be everyone’s mediator someday when it can also translate emotions. Glissant, Edouard, “For Opacity,” Poetics of Relation, University of Michigan Press, 190. Annie Jael Kwan is an independent curator, writer, researcher and producer based in London. She has worked as producer and curator on numerous art projects in the UK and internationally since 2005. She founded the curatorial partnership, Something Human, in 2012, to focus on her interests in the critical ideas and explorations surrounding movement across borders. Something Human has delivered projects in the UK, Rome, Venice, Belgrade, Skopje, Lisbon and in Singapore. In 2016, she completed a self-initiated curatorial research residency with Java Arts in Cambodia, with the support of the Artists International Development Fund (British Council/Arts Council England) and the National Arts Council Singapore. This generated the collection of interviews and digital materials that would form a significant part of the pioneering Southeast Asian Performance Collection, launched at the Live Art Development Agency in London during the M.A.P. (Movement x Archive x Performance) project. She was also selected for the International Curators Forum’s curatorial programme, “Beyond the Frame”, and for Outset and Arts Council England’s development programme for emerging curators.